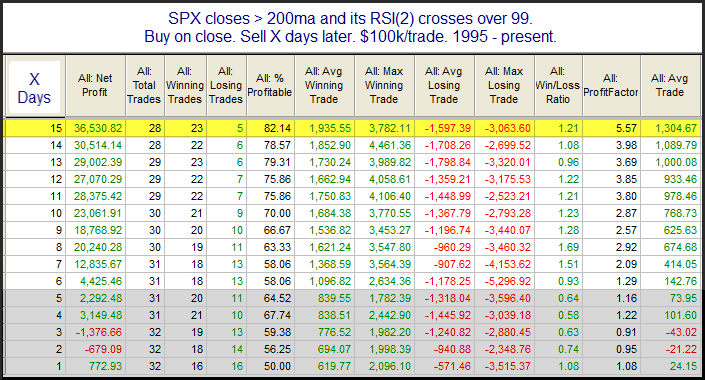 It appears the real damage has been done during long-term downtrends. 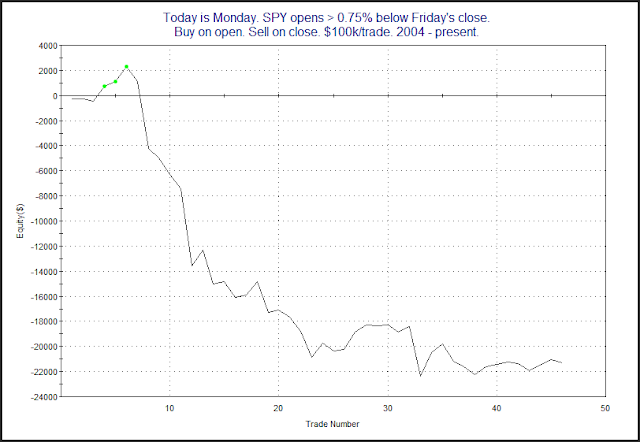 During uptrends, big gaps down on Monday's have been neither reliably bullish nor reliably bearish. Additional evidence would be needed for me to initiate a new position. Going into the day yesterday we had a Turnaround Tuesday setup. When the market is down 3 days in a row going into a Tuesday, it has had a strong tendency to bounce. Of course there have been instances over the years where it hasn’t. And yesterday was one. When it doesn’t rise on Tuesday what does that mean for Wednesday and beyond? Though it has appeared in the Subscriber Letter numerous times over the years, I have not shown the test below on the blog since August of 2012. It answers that "Wednesday & beyond" question. Results here have been very strong over a long period. It seems the Turnaround Tuesday failure has typically been a temporary setback. Today’s movement will largely be due to the market’s reaction to the Fed. But I thought I would share a study that triggered yesterday that would perhaps have a bit more influence on a non-news day. 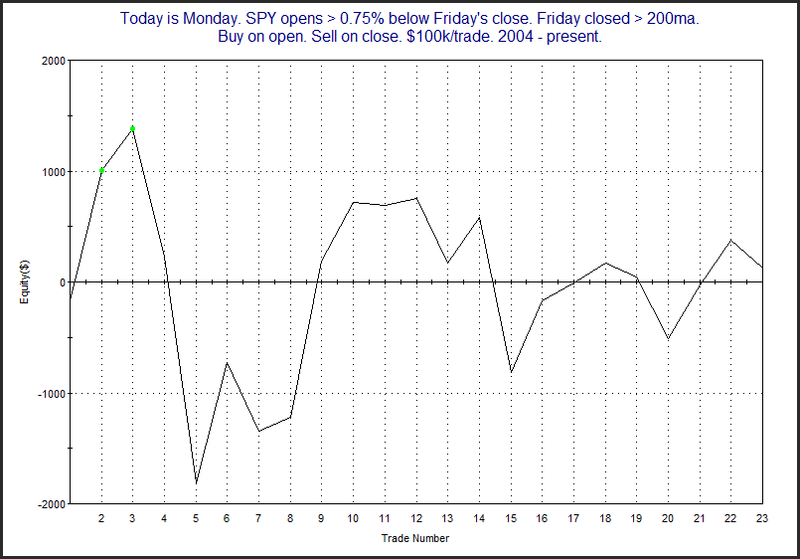 It looks at days like Tuesday where the market gaps higher, never fills, and moves higher from open to close without making a higher high. 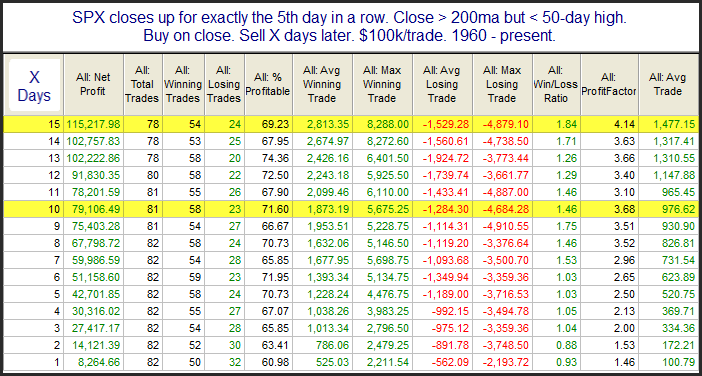 Implications here appear somewhat bearish, with most of the damage occurring on day 1. 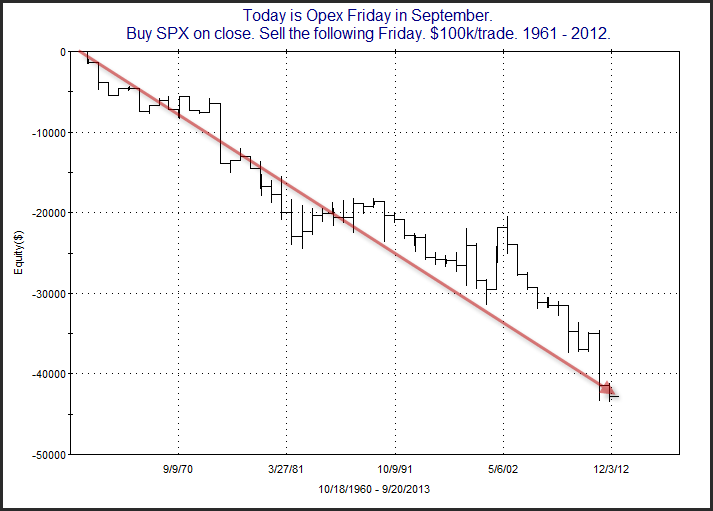 Traders may want to keep this pattern in mind for the future. Big intraday rallies like we saw on Wednesday that have been followed by tight, low volume consolidations like Thursday have often seen the market roll over. The study below looks at this setup. I last discussed it in in the 8/11/09 Subscriber Letter. 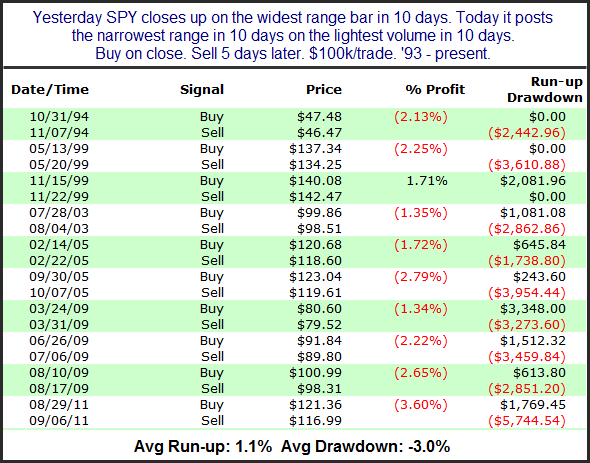 The parameters have only been met 10 previous times by SPY. 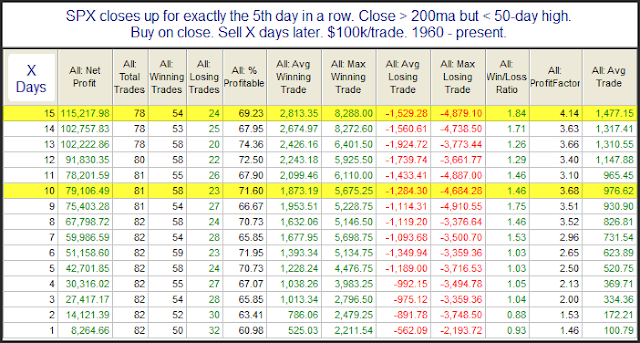 I have listed them all along with their 5-day returns below. Instances are low but the inclination so far is strongly bearish. 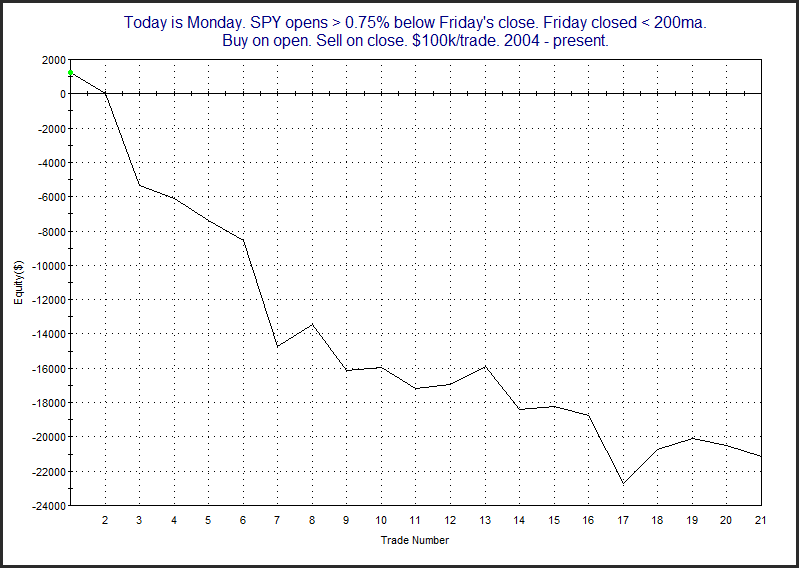 The last 7 occurences closed lower 5 days later, and all by at least 1.3%. Additionally, the Avg Drawdown is nearly 3x the Average Run-up. Even with the low number of instances, I think this study is worth some consideration. Labor Day according to Wikipedia is a holiday “dedicated to the social and economic achievements of workers”. So I was thinking this past weekend about some of the hardest working traders I know. People that not only trade for a living, but as I do, offer products designed to help traders find their way. I made a list of “Real Deal” guys. To qualify for the list you need to meet some very specific, rigid, and somewhat unfair criteria. 1) You must actually be a trader (and make money doing it). 2) You must have a product that I am familiar with and I truly think is valuable to others. 3) I am able to verify 1 & 2 through personally knowing the person. This means we have either met in person, or at a bare minimum, have had several long phone conversations over an extended period of time. If I don’t know you, you aren’t on this list (that’s the unfair part). 4) You are not part of a large organization. I started writing this with Labor Day in mind. I know how hard it is to run a small operation and have to wear so many hats. Everyone on the list is similar in that they are either solo or have at most a handful of people working with them. So these are all people I feel I know to some degree and who I believe have something valuable to offer. I also think they are upstanding folks who I am comfortable recommending. Of course I think Quantifiable Edges & Overnight Edges are the greatest services out there, but they don’t match everyone’s style, and they don't cover everything. So here are some other Real Deals to check out (in alphabetical order). Scott Andrews (www.masterthegap.com) – “The Gap Guy”. 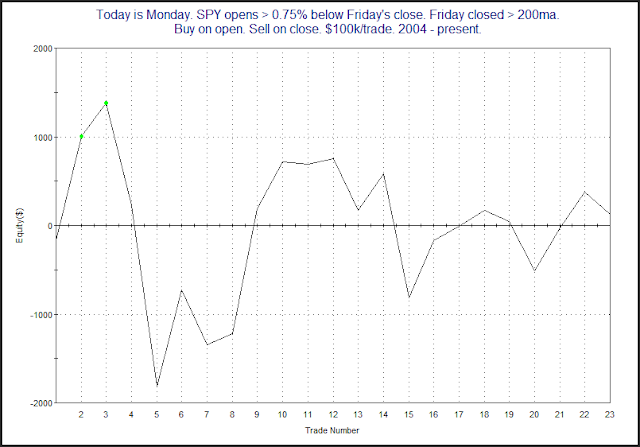 Scott’s quantitative testing is similar to mine, but is focused on gap fading, and some intraday breakout analysis. 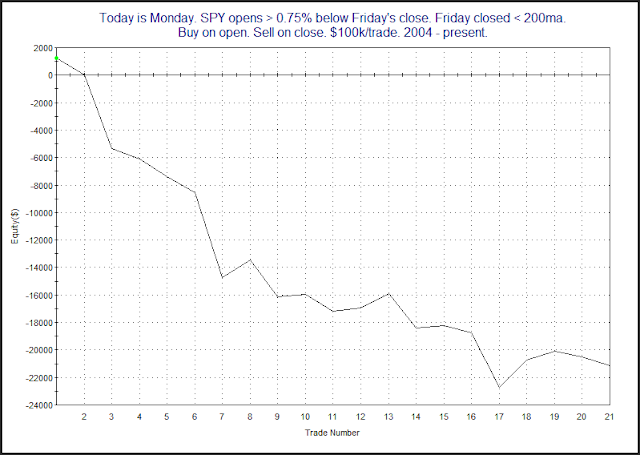 I think he provides solid information for daytraders, I like his style, and he has become a friend over the years. Charles Kirk(http://www.kirkreport.com/) – At $100/year a Kirk Report subscription should be a no-brainer for nearly every trader. His screens, analysis, links, and experience make this a resource well worth checking out. The Kirk Report turned 10-years old this week, showing that this “real deal” (and all-around good guy) has had some staying power. Dave Landry (http://www.davelandry.com/)– Dave’s been around a long time. I’ve always liked his work and his ability to keep things simple. Dave’s sense of humor always seems to shine through as well. He’s tough not to like. Bill Luby (http://vixandmore.blogspot.com/) – VIX & More is a terrific blog. And traders with an eye on volatility should check out Bill’s subscription products as well. He is an incredible resource and a real authority on volatility and ways to take advantage of it. When it comes to the VIX, Bill is THE real deal. Tom McClellan (http://www.mcoscillator.com/) – Tom is one of the most interesting analysts I know. His liquidity wave approach and price pattern analogs never cease to grab my attention. I’ve also incorporated some of his work & ideas into Quantifiable Edges (such as the TICK TomOscillator). His knowledge also goes far beyond stocks. I’ve met Tom a number of times, and have learned something new about science or history every time. 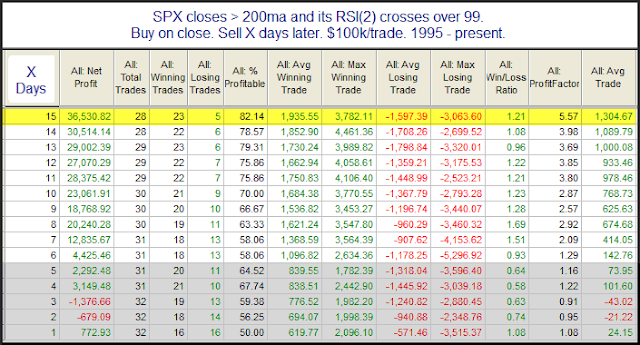 Jeff Pietsch (http://etfprophet.com/etf-rewind-pro/)– Jeff does not blog as much anymore, but his ETF Rewind product is a great tool for ETF traders. It puts the ETF universe in a neat, sortable, format and makes it easier for traders to find opportunities based on a number of technical criteria. Corey Rosenbloom (http://www.afraidtotrade.com/) – The last hard worker on this alphabetical list is also the youngest of the group. But he does not lack for wisdom (or enthusiasm for his own work). Corey takes a solid approach to daytrading and is certainly worth checking out. That’s it. Seven Real Deal people whose work I admire. Check ‘em out when you get a chance. Oh yeah. Might as well plug myself as well. Check out a subscription to Quantifiable Edges (free) or Overnight Edges ($5) sometime if you haven’t before.